Product #30155 | SKU LP36891 | 0.0 (no ratings yet) Thanks for your rating! Nature, wildlife, and travel photographers packing camera gear, accessories, and personal items for their next adventure will appreciate the blue Photo Sport BP 300 AW II from Lowepro . The BP 300 AW II features a zippered side compartment with a removable, equipment insert for storing a pro DSLR, 2-3 lenses, and flash. This insert has thick interior padding, and a touch-fastening divider for organising your gear. Underneath the insert lid are two, slip-in memory card pockets. The gray-coloured interior facilitates locating your gear in low light. The large weather flap lifts to reveal a top storage compartment, which for added protection closes with a cinch strap. Store your bike helmet, light jacket and other items requiring quick access inside the exterior, front pocket. For journeying further, remain hydrated by storing an optional, user-supplied 2-litre water reservoir behind the back panel. Internal routing provides for optimal hydration tube placement. 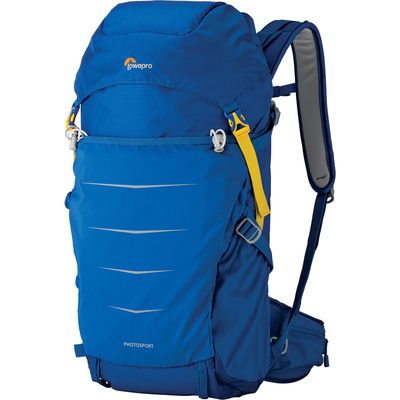 Multiple attachment points on the front of the pack may be used for transporting a tripod, hiking poles, and other items. And for added comfort and stability your BP 300 AW II is easily carried with the adjustable shoulder harness, sternum strap and waist belt. A back panel with mesh padding to cushion impact, wick-away moisture and improve airflow contribute to greater comfort on longer trips. Rounding out the pack is zippered waistbelt pockets, one on each side for sunglasses, phone or energy bar, and a built-in, all-weather cover for protection from the elements. Constructed of N100, N210D, and HD Oxford nylons, your case is both durable and strong.